B1 had a surprise guest this week, Paul Davies, and he wowed us with his chord playing, melodies and tongue articulations! Paul is a SPAH past president and teaches and plays in Colorado. This was his first B1 visit and he was a hit. He was particularly relevant in Joe's new afternoon chording and rhythm class, giving students a vision for where they can take this style of playing and blowing minds with his rapid two-harp playing. Paul was extremely generous with his knowledge and even spent time between classes with David and they performed as a duo in the evening. Very cool! Two harps are always better than one! As Paul says, it's not too early to start thinking about getting out to Virginia Beach for the 2011 SPAH convention, August 9-13. The hotel sounds fantastic and it's just a few minutes to the beach. Can't beat lots of harmonica fraternity, education and a bit of salt water! Watch SPAH.org for more info. I provide "Maintenance Service" mainly for chromatics. Levels of service are listed below. 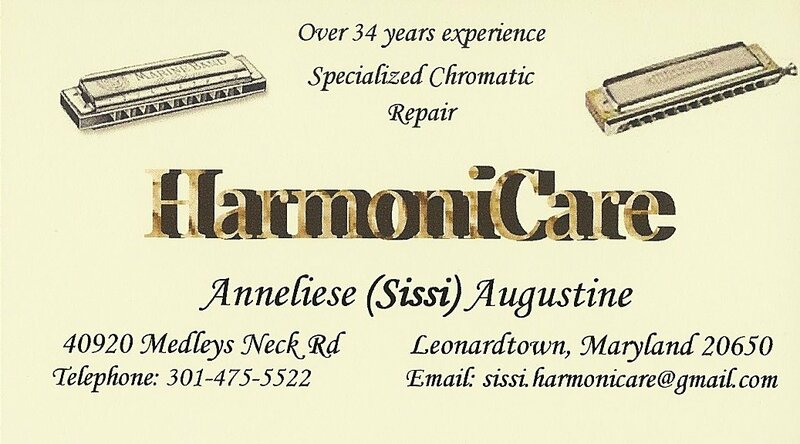 Please contact me via e-mail at sissi.harmonicare@gmail.com. Level 1 - Minimum charge $50.00 + shipping. Includes: cleaning, touch up tuning, valves replaced as needed, replacement of no more than one reed. Level 2 - Minimum charge $75.00 + shipping. Includes: cleaning, all valves replaced, retuning, replacement of no more than two reeds. Level 3 - Total Refurbishment requires an estimate on a case by case basis. Level 1 - Minimum charge $40.00 + shipping. Level 2 – Minimum charge $60.00 + shipping. Other models are estimated on case per case basis (labor plus parts). The next session at the Old Town School begins February 28, so register soon!